Well, I did it! I completed the first 10 days of the 24-day challenge. And, even though I am STILL sick, I feel great! I feel lighter, I feel less bloated, I have more energy (can only imagine how much I'd have if I wasn't ill). I just feel kinda invigorated. 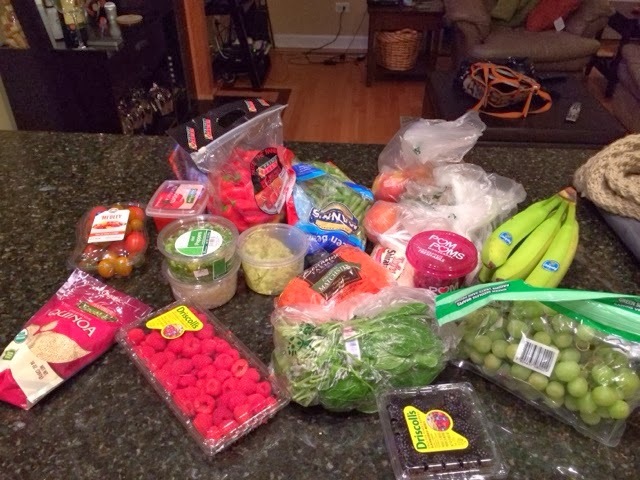 My groceries from the first haul to the store for cleansing foods. So, how'd I do? I told you how closely I stuck to the cleanse for the most part. 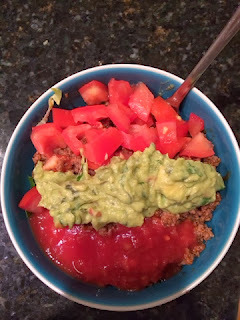 I got to Friday and since it was Valentine's Day (and the hubby and I were celebrating our 14 year dating anniversary), I stuck to clean eating but did have a couple glasses wine. 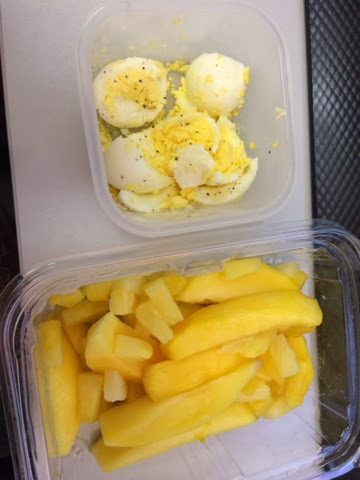 Same deal with Saturday - continued eating clean, but had a couple of cocktails while out with friends. My results after 10 days of fruits, veggies and protein, with no carbs, dairy, sugar, caffeine or alcohol? So, a total of 4 lbs and 4.75 inches? I'll take it! I took before pictures and swore I saved them, but can't find them anywhere. So, if I'm brave at the end of this, maybe I'll post some transformation photos. All in all, I highly recommend this cleanse for anyone looking to jumpstart their weight loss. I will be happy to give you all the details on the products I took, and if you are looking for a distributor, feel free to contact my sister, Natalie! Now, some of you have been asking what I've been eating on the cleanse. Like I said, I didn't find the eating part to be difficult. For breakfast, my meals typically consisted of eggs (hard boiled, soft boiled, or scrambled) with some fruit and Spark. 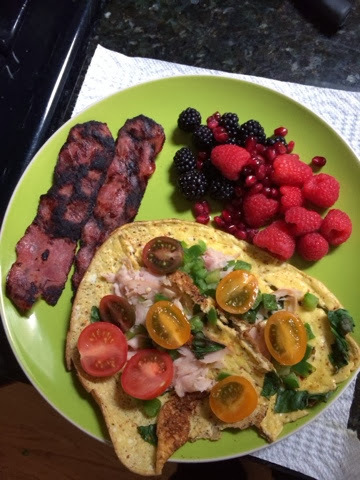 On the weekends, I added some turkey bacon. I also made these egg muffins, which were good, but which I managed to eff up. For lunch, I would typically have either a salad with chicken and lots of veggies, with a lite Italian or balsamic dressing. But, since I was sick, I made a couple of big batches of soup that lasted me many a lunch during the 10 days. 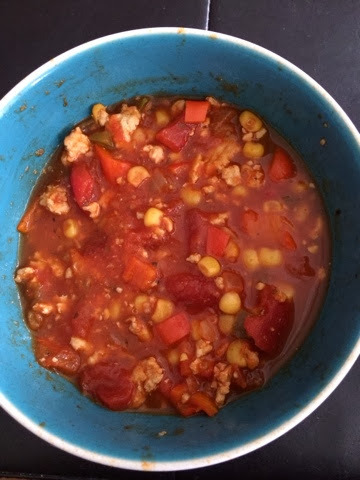 I made chicken noodle (with no noodles) and also this amazing Stuffed Pepper Soup, which I adapted by using ground turkey and no brown rice, and adding corn. For dinners, again, more veggies and protein. I made taco salads one night, but skipped the cheese and sour cream. 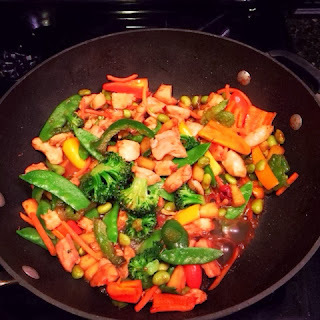 Another night was stir fry, no rice. Tofu Shirataki noodles with marinara and a side salad. Again, I made big batches of stuff, so I usually was able to get at least two dinners out of a recipe. For snacks, I kept it basic: Grapes or a Banana with 1/4 cup almonds. Peppers or carrots with hummus. In the later part of the cleanse, I started drinking those Naked juice smoothies, which I LOVED. I also tried Kind bars (the almond and cranberry ones). That's about it! I have several recipes pinned on Pinterest that I haven't tried yet but plan to in this next phase of the challenge. If I can answer any questions for you, I would be more than happy. All in all, I highly recommend this whole plan and I look forward to seeing what happens in the next 14 days!